Tucked away in a scenic corner of Southern Utah where red rock vistas permeate the landscape, Hildale City offers a comfortable country setting. Unfortunately, on September 14, 2015, that comfort was stolen in a matter of minutes when a large flash flood washed away two vehicles, claiming the lives of 13 residents, including three women and ten children. During the recovery operation, various state and local government officials, including Utah Governor Gary Herbert, visited the site and pledged their support. The City sought reparation measures that would prevent future occurrences while providing healing for the community. Constructing a bridge in place of the at grade crossing that was destroyed during the mudslide was a significant feature of that support. Sunrise Engineering, the project's engineer, worked with Contech Engineered Solutions LLC to determine the best replacement for the at grade crossing on Canyon Street. In the end, a 24' x 10' CON/SPAN® B-Series® Precast Bridge System, 120' in length, was selected for its geometry, hydraulic capacity, and ability to handle deep cover. At the location where Maxwell Canyon Wash crossed Canyon Street, there was a deeply incised channel followed by a drop-off. As a result, the elevation of the bridge dropped well below finished grade. To counter this, tall precast headwalls and wingwalls were designed and installed. To safeguard the bridge from future scour, the footings were anchored to bedrock and riprap was grouted into place both upstream and downstream of the bridge. During construction, there were no alternate routes for traffic so it was critical that the road remained open. For this reason, the bridge was built in phases about a month apart. Installation of the structure occurred on two separate dates, equating to two days of assembly time. Hundreds of residents showed their support as they lined the hills and roads surrounding the wash, observing the construction activity. "Contech delivered the bridge sections on time and in such a way to correspond with the project installation requirements," stated Joe Ipson, Project Manager with Interstate Rock. "They assembled easily and fit perfectly. The support staff made installation flow quickly and without delays." Shortly after the structure was completed, monsoon season rains sent significant flows through the channel. 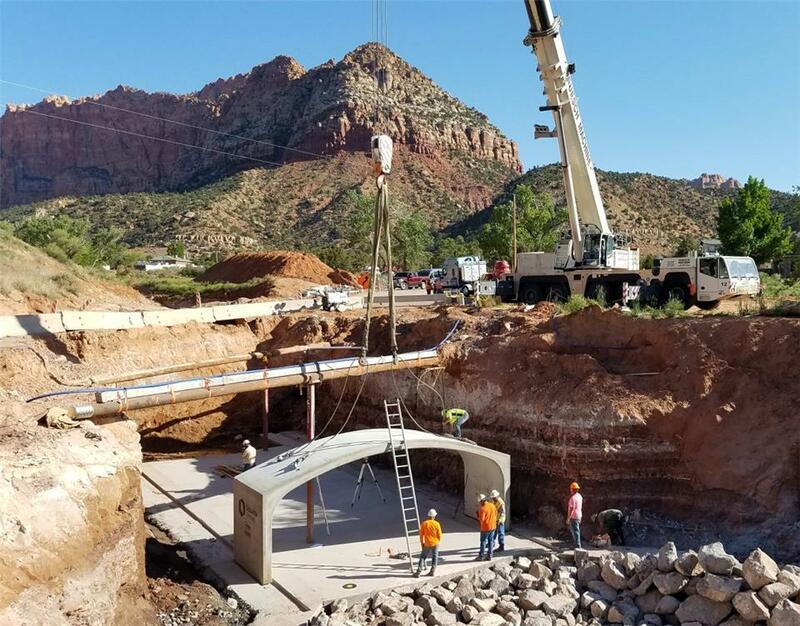 The system performed as expected and residents were relieved to have a safe crossing over the wash. During a walk through of the site after completion, Mayor Philip Barlow of Hildale commented, "The project was well accepted, appreciated, and needed by the community. Having the bridge helps me sleep better at night. It's a good product."